Since Australian citizenship was first introduced in 1949, more than 5 million people have become citizens. 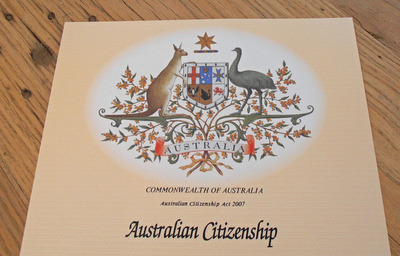 Citizenship means you are entitled to an Australian passport. According to the Henley and Partners Visa Restrictions Index, this is one of the best passports in the world to travel under. Ranking 7th on the Henley Index, an Australian passport enables you to visit 170 countries without a visa. When you become an Australian citizen, your overseas-born child can become an Australian citizen by descent. They’ll have exactly the same rights as a child born in Australia. This is actually mandatory for Australian citizens aged 18+. You’ll be called up to vote in local, state and federal government elections and referendums. Failing to do so can result in a fine and potentially a day in court. Although voting is (controversially perhaps) compulsory in Australia, unlike some countries, you at least have the freedom to vote for your chosen candidate. Plus, you’re actively taking part in the democratic process and helping to shape Australia’s future. As an Australian citizen, you could be called to sit on a jury. If you’re contacted for jury service, you’ll receive a token payment (this varies by state) and your employer will be legally obliged to provide the difference between jury pay and your regular salary for 10 days. Whether you see jury service as an interesting diversion or a chore to be completed is up to you! Australia has many embassies and consulates overseas and while travelling as an Australian citizen, you can ask an Aussie embassy or consulate for help in the case of an emergency. Consular assistance isn’t guaranteed and depends on the circumstances, but Australian consulates or embassies can issue replacement passports, assist with medical emergencies or provide help if you’re the victim of crime. They can offer help and advice if a loved one dies overseas or issue emergency loans in exceptional circumstances. The Australian army requires all recruits to be Australian citizens. Permanent residents can access many public sector jobs in Australia, but certain divisions, such as the Department of Foreign Affairs and Trade and Border Force also require citizenship. All Australian citizens over the age of 18 have the right to stand for election as a local councillor, state or federal MP or senator. You can’t hold dual citizenship (unless a pending High Court decision rules otherwise) if you plan to serve in federal parliament. Before political nomination, you would need to renounce your home country citizenship. Some Australian states or territories require one or both adoptive parents to be an Australian citizen. As an Australian citizen you can access HELP – the government’s Higher Education Loan Programme, to enable you to defer study costs until you’re earning enough to repay the loan. Permanent residents don’t have access to HELP, but they can enrol in University as a domestic student, rather than an international student, which means much lower fees. If you're the active type, you could represent Australia at international sporting events, many of which require participants representing Australia to be Australian citizens. Finally, citizenship enables you to stay outside Australia as long as you want, without the need for a Resident Return Visa. Plus, you can’t be deported for crimes committed after becoming a citizen. Permanent residents can be deported if they commit a crime or cause concern on character grounds. Disclaimer: The information provided here are the outcomes through google search. You are requested to verify before act. Till today, there have been 14891 visitors (25014 hits) on this page!